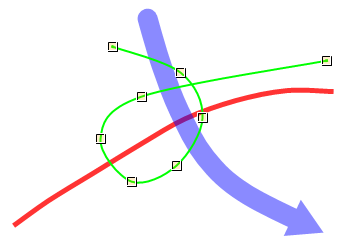 The Curve tool lets you draw curves such as the ones below. A curve can be drawn anywhere in the image by drawing as if you were holding a pencil. Click and hold the left mouse button, and drag to draw the curve. Click on one of the curve's handles and drag it to a new position while holding the left mouse button down. The covered distance measurements are Euclidean covered distances measured in the world plane. These covered distances are meaningless unless the world plane (reference plane) has been identified with the Reference plane tool. By moving one or more of a curve's handles, the measurements will be automatically updated to accommodate the change. The same is true if the reference plane is changed. Generated on 4/25/2019 11:29:25 AM (PST) ADI/HQ/GBA/2019/ARIELCLOUD/v3.0.2018.0126.